Never more real and vivid than when recollected in the imagination. And, our memories, particularly those which carry the most emotional charge, are constantly being selected, edited and recast. The stream of memory is never stilled. The genesis of a song, a poem, a story or a painting begins in an insistent whisper from the memory. A whisper which cannot be ignored. Such a whisper was heard in the 1930s by Jack McAuliffe from Lixnaw in County Kerry as he sat sat in a cottage near Dooneen Point. In response he wrote a poem that became the ballad, ‘The Cliffs of Dooneen’. The key duty of an creative artist is to closely attend to those whispers and make them real in words on the page, notes in the air or brush marks on the canvas. And, the truth of the song or the poem or the painting is the truth of the imagination and cannot be reduced to the mundane metric of exact measurement. So too the trembling hare and the lofty pheasants making homes for their young. And, whoever you are, wherever you are, however far you have traveled from your own native home far away from the mountains and away over the foam you will have within you memories of all the kind people you have left behind. In the quiet watches of your dreams you will bathe in the streams and the meadows of your youth. And, when you hear, ‘The Cliffs of Dooneen’ you will find yourself singing along with a full heart and tears in your eyes. We return to the theme of The Horse in Irish culture. 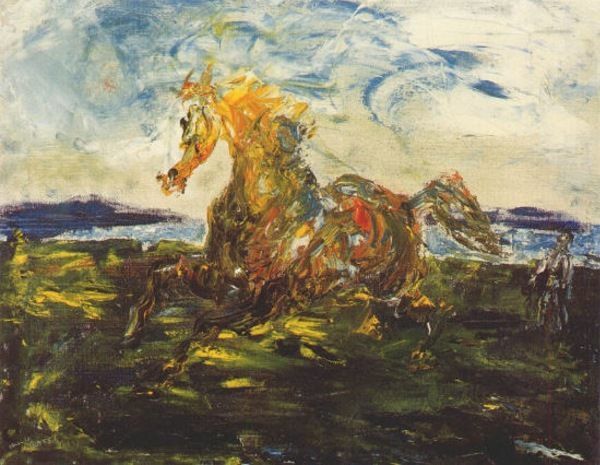 I have seen many thousands of horses in my life yet I have never seen a horse so thrillingly, mystically, alive as the horse in Jack B Yeats painting above.